Williams Martini Racing driver Valtteri Bottas finished the 2013 Formula One season in 17th place in the driver’s championship, just one spot above his teammate Pastor Maldonado. Certainly not a terrible outing for a rookie in the series. 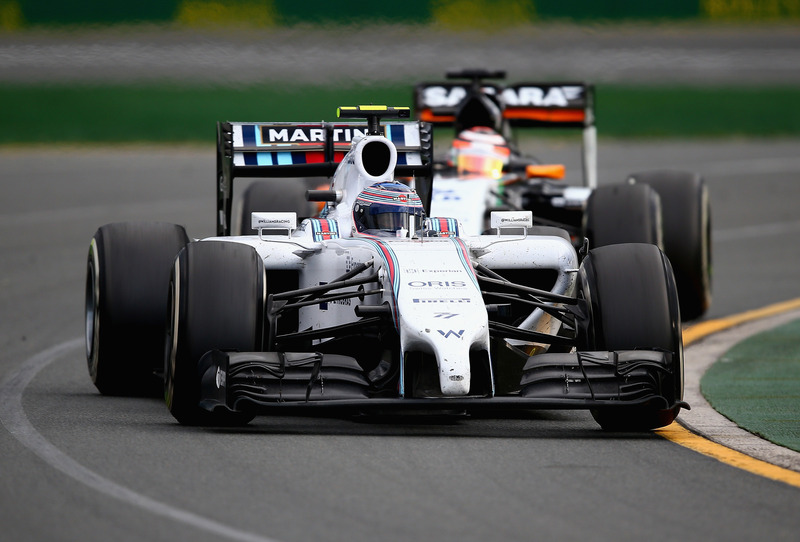 But 2014 was a different story for the Finn, paired with ex-Ferrari driver Felipe Massa, Bottas finished in the top five of the points standings and came close to clinching a race win for Williams on several occasions. In the first five races of the 2014 season, Bottas had consecutive top ten finishes with the highest being fifth place in both Australia and Spain. His 13 year-F1 veteran teammate had finishes of 20, 7, 7, 15, and 13 in those same five races, with Australia being a DNF due to a first lap crash. Bottas has his lone DNF of the year in the next race, Monte Carlo, due to an engine failure on lap 56. After the disappointing setback in Monaco, Bottas really set himself apart from the “rest of the pack” and established himself as a firm competitor with the Mercedes duo of Nico Rosberg and Lewis Hamilton. The remaining 13 races on the calendar saw top ten finishes in all but Singapore (13th place finish) for Bottas, eight of those being top five performances. In 2013, Valtteri Bottas had one top ten finish all year which came in the form of a P8 performance in Austin, Texas. Along with natural improvement, much of his success can be attributed to Williams’ 2014 chassis design and overall performance. In 2014, the only mechanical failure came in Monte Carlo with an engine failure, making Williams one of the most reliable teams in the sport. Only Force India and McLaren had just as impressive reliability, with one mechanical failure for each. Bottas is just 25 years old, making him one of the younger drivers on the grid, and has all the signs of a long, successful career in front of him. 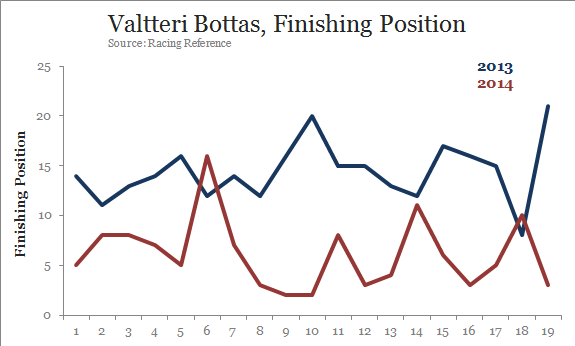 The large improvement from last year is a good sign of things to come for Bottas. With Williams Racing regaining some of their historical success in recent years, the team is a good fit for a championship contending Bottas. 2014 was an inspiring year for the young Finn, and he’ll be looking to build on that and take another shot at the title next year.